Is there any diagrams for the jacking points on the C-Max? I don't think I've seen it in the manual and I haven't been able to find it online. I have the same question. I asked the CS lady at the dealer who said she would get that info (which I was told is in the shop manual by Ford), but I have not heard back. Ford themselves said that they have the info, but would not provide it and would not say why. I called my dealer and left several messages, but no response from them. The funny thing is, they have been on me to answer the satisfaction survey, but I am pretty sure that would not be good for them, the more I have to deal with the dealership. Edited by CNCGeek, 06 November 2012 - 12:41 AM. I figured I'd at least be able to find jacking points from the regular C-Max but I haven't found anything yet on google. I want to be able to change my tires without taking the car to the dealership everytime. It says there are indentations marking the jack locations in the sills, and I see one similar location on the front of my vehicle (an upside down "U" cut into one side of the sill). In the rear there are two raised areas along the seam where the panels are joined which may also mark a location to place a jack (this is just a guess), but there is no upside down U cutout/indent like in the front (similar to what the UK manaul shows). I could not trust the UK info anyway without confirmation from Ford though. I still have not been able to contact the CS lady with my dealer who said she would help me get the page from the maintenance manual showing the lift points, but I am going to keep bugging them until I get something. So, still nothing on jack points. Well I jacked up my C-Max yesterday. I did not see the notches that are mentioned in the European C-Max manual but there are 4 distinct "square" openings on the underbody shield. I used those areas to jack up the car to change all 4 tires. I haven't found anything definite in terms of official information but that worked for me. I used a floor jack. Think you cell phone snap a pic of? There are small downward-pointing triangular depressions molded into the plastic rocker panels that I have to assume are meant to be jacking point locators. They correspond with the openings in the underbody shield. The triangles are visible if you get on your hands and knees and have good lighting. I jacked up the car using these points a few days ago to change the tires. I didn't notice the triangular depressions that were molded into the plastic rockers. Edited by RaPieR, 19 November 2012 - 02:11 PM. I stopped by the area's biggest Ford dealer and they had no clue of the jack points. It isn't their dealer FAQ database either. Quite hilarious. Thanks for the pics. Fascinating how sloppy the bottom is and how easy the underbody shielding either abrades or is that foam adhesive over spray? Looking over fit and finish of one of the cars they had on the lot had me questioning buying one. Lots of little things. Nothing big mind you. Such as the u-bolts the back hatch latches to were not equidistantly protruding from the body. Sloppy body mastic painted over in number places. Foam sheet material protruding from various openings in the door, e.g. from around the child locks on the rear doors. Otherwise, it is nice car. Very, very quite. The Ford Fusion though threw me. The Hybrid version has the same hybrid engine crammed under of the C-MAX's hood. You can see more of what is tucked up under that expansive C-MAX dash. And the dash was cleaner specifically the center section. The dealer had the same problems others have noted of finding the car dead in the morning needing a jump. Funny thing is a Fusion Hybrid fully loaded is cheaper than a a C-MAX. You just don't get as expansive storage space, but the Fusion's trunk is cavernous and the rear seats have same split and fold down. The Fusion's styling is nice. And quite surprising. I've read Ford will also sprinkle the same Hybrid engine into their Lincoln MKS-something or other. Edited by nemonik, 19 November 2012 - 10:43 PM. I have a 2003 Corvette that has those same four oval openings. That's were the tie down fittings were put when the car was shipped from the factory. On the Vette, they are strengthened, so GM indicates they are alternate jacking points. Perhaps we can assume the same for the C-Max. A vendor created special jacking pucks, but the set I have for the Vette are a hair too large for the C-Max. However, folks have built these using hockey pucks. An internet search for "Corvette jacking pucks" will give you an idea what these look like, and how you might fashion one from a hockey puck and a wingnut. They provide a nice buffer between the floor jack and the car frame. Jacking points are not a big deal here.... There are arrows molded into the rocker panel trim, and up underneath are nice strong seams in the steel exposed to jack up the car. No worries. Thanks for pointing out the molded in arrows, I missed them when I checked earlier. I disagree with it being no big deal though, unless you meant for yourself. I consider it a medium sized big deal because the jacking points (and alternate points) were not shown in the manual, and that is basic info on any car (and Ford and my dealer were not willing to provide the information which is doubly ridiculous). Edited by CNCGeek, 24 November 2012 - 01:48 PM. Last night, I got on my hands and knees with a flashlight and a big mirror to find these jacking points. The mirror made it pretty easy to find the square opening in the front that has the oblong 1 inch hole in the center of it. The rear jacking point just has a hole in the center which was 14 inches in front of the rear tire. When the time comes to switch over to winter tires, I want to know where to place the floor jack so I don`t bend something and later regret it. I really liked the hockey puck idea but in the end I just glued up a couple of 3/4 inch by 4 inch square plywood pieces to place on top of floor jack saddle to keep from bending up or damageing the 1 inch vertical metal seam at the sill. Anyone else care to share their thoughts? I don`t expect to get much information from the dealer but I must admit I have not asked yet either. We just bought the C-Max a couple of months ago and have a lot to learn. Yes the jack points are omitted from the manual but as has been mentioned there are triangles molded in the bottom trim piece (see photo). Out of curiosity while I was doing a tire rotation, I found a point a couple of inches in front of the B-piller (the one between the doors) will lift both wheels (used a large floor jack for that). NOTE: bottle jack pictured below will not fit if tire is completely flat. Use a scissor jack! Edited by fotomoto, 03 September 2013 - 10:00 PM. 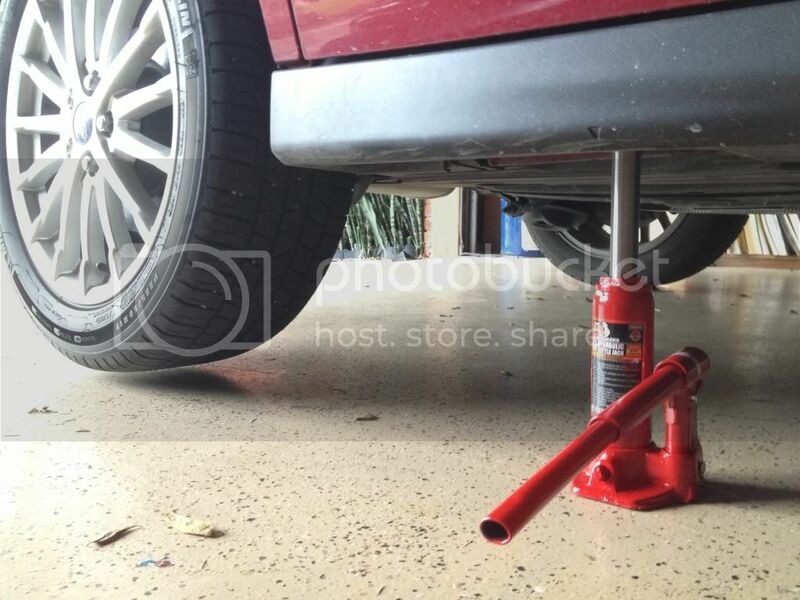 Thank you for the nice photo and information on an alternate jacking point for the C-max. Having one jacking point that will lift front and rear is a real advantage and time saver! The bottle jack makes it a little more simple also. I have one of those big floor jacks sold by Costco and it is a lot of work to use on a small car. I just did a test fit of my laminated plywood 4" X 4" X 1 1/2 square and it is too big to be useful. If I use it at all, I need to cut it down to 4 X 3 inches. When I get time, I will run the C-Max up on ramps and look for the B-Pillar spot that you posted. This morning, I stopped to talk to a friend of mine who has his own independent shop and asked him about the jacking points since a lot of cars share the same pinch seams that are used as jacking points. He said that yes, while the pinch seams look weak, they are indeed strong enough for jack placement. In my situation, I would be using a floor jack that has a rubber pad where it meets the jacking point. I have the room to store all kinds of project material, so I made up some pads that had a step out of plywood and made another one from left over composit deck material to place between the jacking points or pinch seams and floor jack. The plywood ones actually clip in place so you don`t have to hold them while you place the floor jack. I must be one of those people that can make a paper clip complicated, but I feel better now about being able to jack the car up without damaging something in the process. I found a good jacking point on the inside of the rocker seam, behind the front wheelwell. You can see a gap in the felt cladding and an oval hole in the rocker panel. It will lift both front and rear tires off the ground. It's good and solid. I've put it on jack stands at these points, using blocks of wood to spread the load. Edited by GBranyan, 14 October 2014 - 07:59 PM. Edited by mtb9153, 14 October 2014 - 10:58 PM.